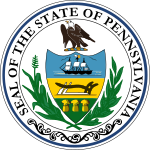 Pennsylvania held its elections October 11, 1814. Plural district with 4 seats Adam Seybert Democratic-Republican 1809 (Special) Incumbent lost re-election. William Anderson Democratic-Republican 1808 Incumbent lost re-election. Charles J. Ingersoll Democratic-Republican 1812 Incumbent lost re-election. John Conard Democratic-Republican 1812 Incumbent lost re-election. Plural district with 2 seats Roger Davis Democratic-Republican 1810 Incumbent retired. Jonathan Roberts Democratic-Republican 1810 Incumbent resigned February 24, 1814, when elected U.S. Senator. Successor was not elected to finish the current term. Plural district with 2 seats James Whitehill Democratic-Republican 1812 Incumbent resigned September 1, 1814, to engage in mercantile pursuits. Edward Crouch Democratic-Republican 1813 (Special) Incumbent retired. John Rea Democratic-Republican 1813 (Special) Incumbent retired. Robert Brown Democratic-Republican 1798 (Special) Incumbent retired. Pennsylvania 7 Daniel Udree Democratic-Republican 1813 (Special) Incumbent lost re-election. Plural district with 2 seats Isaac Smith Democratic-Republican 1812 Incumbent lost re-election. Jared Irwin Democratic-Republican 1812 Incumbent re-elected. Pennsylvania 14 Adamson Tannehill Democratic-Republican 1812 Incumbent lost re-election. ^ a b Won special election to fill vacancy in 13th Congress.